An effort to create a manual on law governing space war is named for the Woomera Test Range in South Australia, shown here. The hope is that this work may help deter such warfare from happening by spelling out what its consequences may be, researchers said. "The technology for operations such as anti-satellite warfare or GPS jamming already exist," Elsbeth Magilton, executive director of the Space, Cyber, and Telecommunications Law Programs at the University of Nebraska College of Law, told Space.com. "And a lot of people don't realize how our financial systems now depend on GPS — it's used to help authenticate transactions. If the space assets controlling GPS are taken out, that would bring financial markets to a halt." Seeing space as an arena of war "is difficult for many to conceptualize, but in reality, space is already entrenched in a plethora of national security concerns," Magilton said. "While these issues are far from new, space security is suddenly receiving attention on a global scale right now." For example, in March, President Donald Trump called for a dedicated U.S. military space force. "We have the Air Force; we'll have the space force," he said. However, the laws that govern the use of force in outer space are currently unclear. The few international treaties that do deal with outer space provide little regulation of modern space activities, including both military and commercial uses of space, said Melissa de Zwart, dean of Adelaide Law School in Australia. A better understanding of how international laws on Earth might apply to conflict in space might help in conducting diplomacy and forging treaties to prevent such warfare. "The goal is to deter such wars from happening in the first place, or to determine the most appropriate and proportional responses to any actions in space," Magilton said. In pursuit of this goal, an international team of legal experts is now developing what they hope will become the definitive document on military and security law as it applies to space: the Woomera Manual on the International Law of Military Space Operations. Partnering institutions include the U.S. Naval War College and Xiamen University in China. 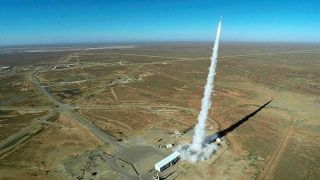 "The project is named after the Woomera township in South Australia, which has a long association with both Australian and multinational military space operations — in 1967, Woomera was the site from which Australia successfully launched its first satellite, becoming only the fourth nation in the world to do so," Magilton said. "In Australian indigenous culture, a 'woomera' is a traditional spear-throwing device. The name 'woomera' originates from the Dharug language of the Eora people." The Woomera Manual "is quite similar to other manuals that have been developed by legal and policy experts over the last 20 years, such as the Harvard Manual on Air and Missile Warfare, and the Tallinn Manuals dealing with laws applicable to cyber operations and warfare," Magilton said. "The goal is to articulate how international law generally applies to military space activities in a time of rising tension or armed conflict. Preparing a manual is a structured way to gather an international set of experts in order to agree upon how the law applies in these situations and then provide that guidance to policy and decision makers." Although such manuals are not binding or authoritative law, they do provide critical guidance, Magilton said. "We hope the manual is a meaningful resource to policymakers as they draft and consider new legislation or international agreements," she added. The rollout of the Woomera Manual on the International Law of Military Space Operations was announced April 9, and it should be completed in 2020, Magilton said.